You can indicate exactly which refinement types will be available to users of your search. Refinements of each type are set in the corresponding block. To make each refinement type available in the search form, enable the corresponding block using the switch in the title block. The order of blocks in the settings interface (from top to bottom) corresponds to the order of pseudo-links in the search results (from left to right). Drag the the block to the appropriate place to change its position. To save any refinement settings (including enabling or disabling blocks), click the Save button. To customize any type of refinement, click on the name of the corresponding block. There are no settings for date refinements. 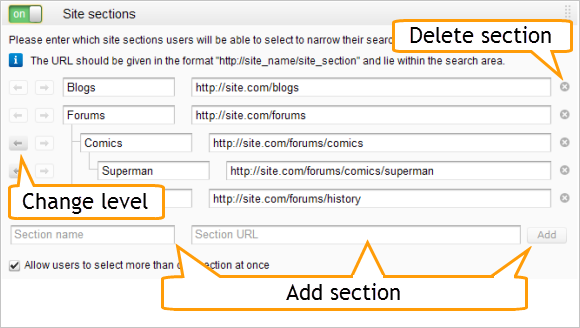 The Site sections block lets you set up a section tree. Three branch levels are supported. You can change the section's branch level using the arrows on the left part of the line. By clicking on the arrow, the parent refinement will merge with all daughter refinements. You may all change the sections' sequence order and branching by dragging the corresponding lines with the mouse. Remember: if you move a parent section, the daughter sections don't transfer with it. Instead, they move to a higher level on the tree. The Keywords block contains a text field with lines that contain keyword phrases. To delete a refinement, erase the corresponding line. Empty lines are ignored. The Custom refinements block allows you to create individualized refinements using Yandex's search language. The supported operators are described in the section of Search help. To change the refinement sequence order, drag the necessary lines with your mouse. By default, the site's visitor can select several refinement options at once. To disable all refinements, maximize the corresponding block and uncheck the box that allows you to select several options simultaneously. Each block contains a box like this with the exception of date refinements.